Preparing your children to thrive in a global and multicultural world! Our mission is to inspire, support and be a resource for our community, empowering our children with Spanish language skills through our immersion program. Understanding the capability of young children to learn languages; the benefits of future job, studies and travel opportunities for children by being bilingual; the need for the Hispanic community raising their children in the US to preserve their language and culture & the goal to equip this generation with foreign language skills, All Kids Spanish was born. Our program provides a strong progressive program with 6 different levels of instruction. We assess the children when they register to make sure they are placed in the right level. From early childhood to high school & beginners, intermediate and advanced levels; there is an option for your specific needs and schedules. When committing to the program, attending on a consistent basis and going through the different levels, speaking fluently, reading and writing in the Spanish language are the goals that you can expect to accomplish. We have made every effort to create an environment where we offer personalized programs. Our Spanish Language Hub/Studio, located in the heart of Orlando Fl, where children are participating in hands on and fun activities and immersed into the Spanish language with cultural relevant content. We also come to schools, libraries, children’s educational organizations, etc. A percentage of the company’s profits goes directly to donations and sponsorships to children with the Faith Seeds program in Guatemala and Mission International in Central America. They can learn, practice and/or improve their Spanish language skills through research based methodologies for foreign language learning where children are actively participating and engaged. We have been attending All Kids Spanish classes since June 2013. My 4 year old was repeating words and singing songs in Spanish after just two classes! She has been enrolled in Spanish twice a week for ten months and now fully understands the language. She sings and speaks in Spanish daily at home and loves it! The teachers are flexible, patient, encouraging, enthusiastic, creative and nurturing to my girls. 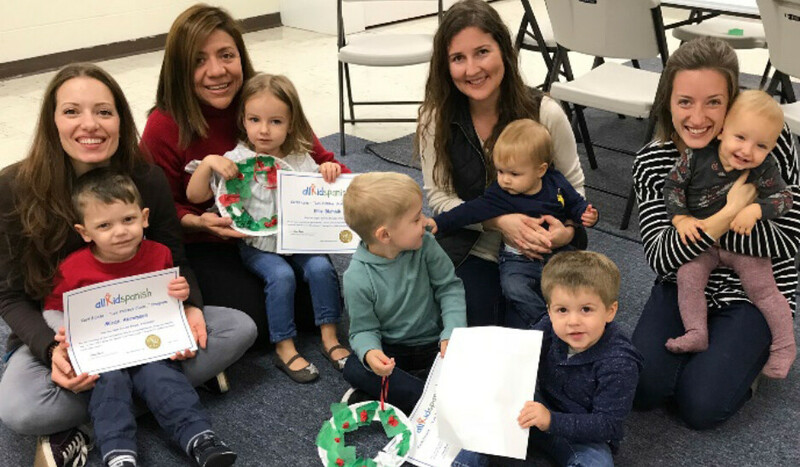 They connect with them and are able to share their amazing gift of teaching Spanish through creative play. Every week is a different adventure! This has been one of the best decisions we have made for our children. Muchas gracias!! My little 2 year old boy loves this class! I love the class because he can learn Spanish while he is simply having a great time and doesn't even realize that he is learning! He is already starting to use some Spanish and I was very impressed when the other day I asked him if he wanted water and then I said agua and he said "agua, Spanish". He knows the difference between the languages. I was a little concerned at first that he would get confused since he is just starting to talk but he has no problem separating the languages and he seems to love speaking his Spanish words. The program is the best! Being the one bilingual parent in class and trying to instill bilingual lifestyle to my daughters, we love All Kids Spanish class. It reinforces the fun aspect of what I try to teach my kids. I love that we learn new songs and rhymes and it expands our vocabulary in Spanish. I highly recommen the program to anyone, bilingual or not! Thank you for sharing your gift with the world. I appreciate your heart felt dedication- it really shows. Sebastian has learned so much in just a short time working with you. Joanna has a beautiful talent for engaging our little ones and making learning fun. She is a great teacher because she genuinely cares about each child's learning experience. I highly recommend her Spanish program for children.